Open every day 9am to 5pm. Advance reservations required for all safaris. Call 407-957-9794. Get ready for your Florida adventure. 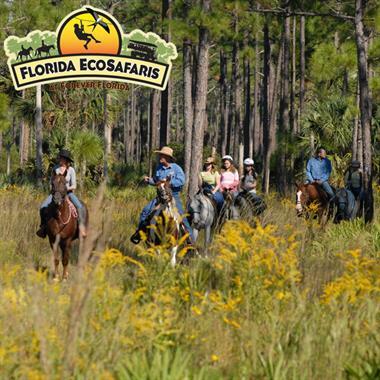 Journey deep into Forever Florida, a 4700 acre working cattle ranch and conservation area preserved just as nature intended. 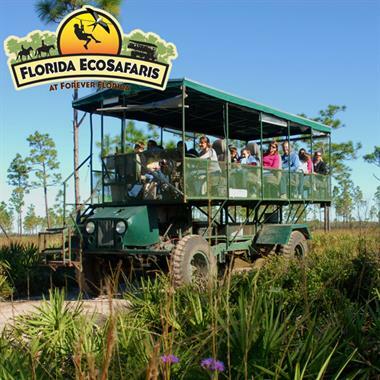 This beautiful site boasts 9 distinct Florida ecosystems and an endless array of natural flora and fauna including alligators, black bears, nearly two hundred species of birds and the endangered Florida panther. 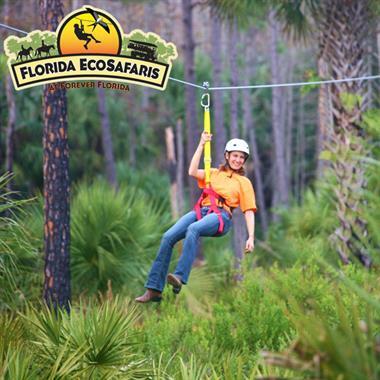 Choose your own fully guided adventure: Nature Tour, Zipline Adventure, Zipline Thrill Pack, Horseback Trail Adventure and Horseback Cattle Drive Adventure. 10 years and up, good physical health and 55 to 265 pounds for the Zipline and Horseback. 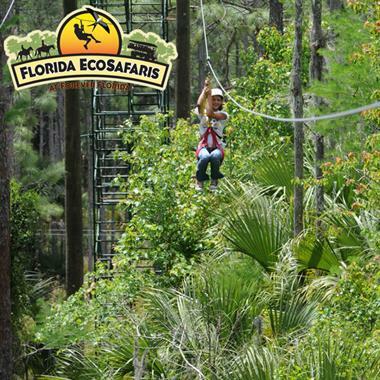 Zipline Adventure: Along the 2.5 hour journey, you'll soar through the tree tops, 78 feet off the ground, and make your way across 7 ziplines and 2 sky bridges. Zipline Thrill Pack: Riders will swing, swoop, jump, zip and dip through the treetops at speeds up to 20 mph along a rigid zip-rail system on the Rattlesnake Roller Coaster, then zip side by side over a quarter mile on the Peregrine Plunge and finally take the leap off the 78 foot Panther Pounce for a controlled free fall! 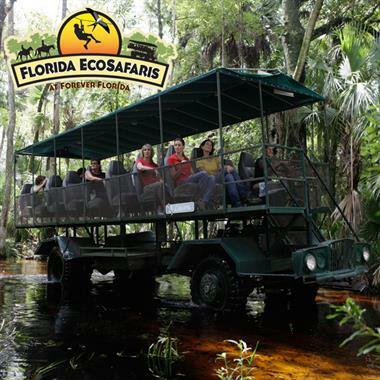 Nature Tour: Sit back and relax on a 2 hour guided journey through 7 distinct Florida ecosystems. Great for all ages and fully accessible. Be sure to bring a camera for the Florida photo safari of a lifetime. 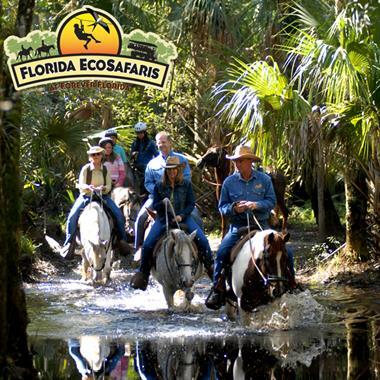 Horseback Trail ride Adventure: Enjoy 1 1/2 hours of scenic riding through the 4700 acre Forever Florida wildlife conservation area led by an expert trail guide. The adventure takes you through 7 ecosystems including a trip through Bull Creek! From Cocoa Beach, head west to get on I-95. Head south to exit #180 for US192. Turn right onto US192 and proceed for 23 miles. Turn Left at the flashing yellow light at US441 and go 7.5 miles.